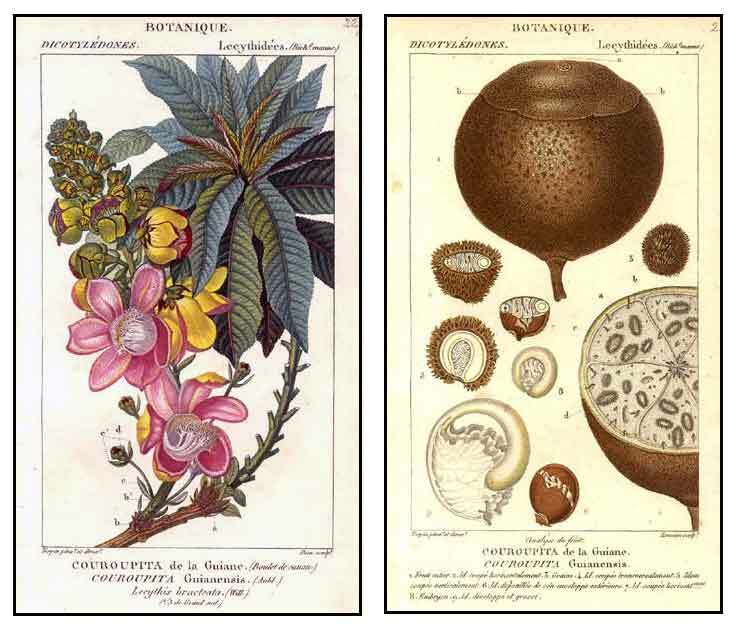 DUTCH: Bosch kalabas, Boschkalebas, Boskalebas (Suriname), Kanonskogelboom. FRENCH: Arbre à boulets de canon, Kouroupitoumou (French Guiana). HINDI: Nagalinga, Tope gola, Shivaling, Ayahuma. PORTUGUESE: Abricó de macaco, Amêndoa-dos-andes, Árvore-de-bola-de-canhão, Castanha de macaco, Cuia de macaco, Macacarecuia. RUSSIAN: Курупита гвианская Kurupita gvianskaia. SPANISH: Ayahuma (Peru) , Ayahúman (Peru), Bala de cañon, Bola de cañon, Coco de mono (Venezuela), Coco sachapura ( Panama), Granadillo de las huacas ( Panama), Mamey hediondo (Venezuela), Maraco (Colombia), Muco (Venezuela), Taparo de Chuco, Taparo de monte (Venezuela), Taparón. Cuoropita guianensis is a large evergreen tree growing to a height of 20 meters. Leaves are alternate, oblong-obovate, up to 20 centimeters long, entire to slightly serrate and hairy on the veins beneath. Inflorescence is racemose, arising from the trunk and other large branches. Flowers are reddish with a yellow tinge on the outside, fragrant, with stamens borne on an overarching androphore. Fruit is a large, reddish-brown globose, 15 to 24 centimeters, with a woody capsule, and each containing 200 to 300 seeds. - As ornamental trees along highways and in parks. - Planted as curiosity tree in botanical gardens. - Native to tropical northern South America, especially the Amazon rainforest, and the southern Carribean. - Also occurs in India, where it is probably native, and Thailand. - Flowers yield an alipathic hydrocarbon and stigmasterol. - Flowers yielded alkaloids, phenolics and flavonoids. - Yielded active principles isatin and indirubin (vital to its antimicrobial activity). - Phytochemical screening yielded flavonoids: 2',4'-dihydroxy-6'-methoxy-3',5'-dimethylchalcone, 7-hydroxy-5-methoxy-6,8-dimethylflavanone and the phenolic acid 4-hydroxybenzoic acid. - Considered antibiotic, antifungal, antiseptic, and analgesic. - Studies have shown antimicrobial, antioxidant, antinociceptive, wound healing, hepatoprotective, anti-inflammatory, anti-quorum sensing, antidepressant, repellent, anxiolytic, antiulcer properties. Fruits are edible, but only occasionally eaten because of the unpleasant odor of the white flesh. - No known medicinal use in the Philippines. - Elsewhere, used to treat colds and stomachaches. - Juice from leaves used for skin diseases. - Shamans of South America used tree parts for malaria. - Fruit pulp used to disinfect wounds. - Young leaves used for toothache. - Used for treatment of tumors. - In South America, used for the treatment of pain and inflammatory disorders. - In Ayurveda, fruit juices used as expectorant in acute or chronic cough and in bronchitis. - Religious / Ritual: (1) Hindus consider it a sacred tree as the petals of the flowers resemble the sacred snake, Naga, a cobra protecting a Shiva Lingam with its hood. (2) In some parts of India, the tree is worshipped by childless couples. - Fragrance: Fragrant flowers can be used to scent perfumes and cosmetics. - Wood: (1) Hard shells of the fruit sometimes used as containers and utensils. (2) Wood used for making incense. - Shell: Used as drinking vessel. • Antimicrobial / Antioxidant: Study showed antimicrobial activity against Shigella flexneri, Staph aureus and Candida albicans. The phenolic and flavonoid fractions showed strong antioxidant potential. • Anthelmintic: Study tested the activity of chloroform, acetone and ethanolic flower extracts of CG for anthelmintic activity against adult earth worm, Pheritima posthuma. The alcholic extract was the most effect in an activity comparable with Piperazine citrate. • Antioxidant / Anti-Arthritic / Anti-Platelet / Leaves: Study evaluated a methanolic extract of CG leaves for in vitro antioxidant, antiarthritic and anti-platelet activities. Leaves, plant plant parts in the cybermarket. Sorting Couroupita names / /Maintained by: Michel H. Porcher / MULTILINGUAL MULTISCRIPT PLANT NAME DATABASE / Copyright © 1995 - 2020 / A Work in Progress. School of Agriculture and Food Systems. Faculty of Land & Food Resources. The University of Melbourne. Australia. 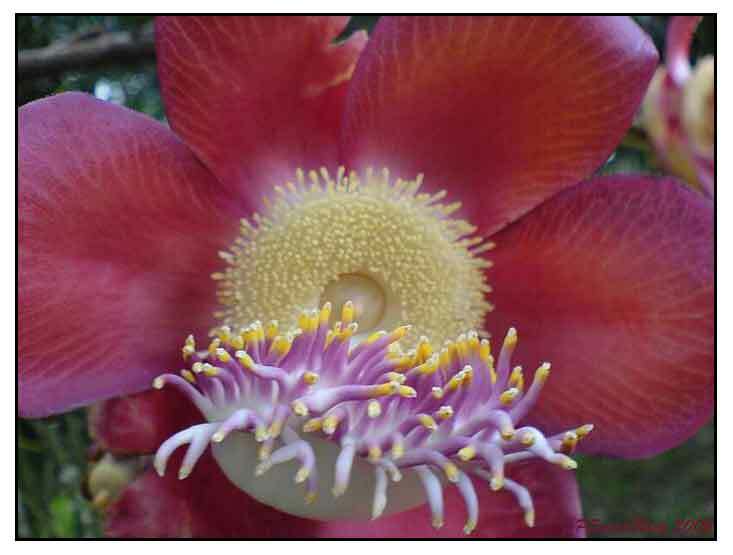 Neuropharmacological Evaluation of the Methanolic Extract of Couroupita guianensis Aubl. Flower in Mice / Vinod H Gupta, Mahendra A Gunjal, Shaijesh S Wankhede, Vishal S Deshmukh, Archana R Juvekar / Int. J. Pharm. Phytopharmacol.Res 04/2012; 2012(1):242-246. Protective effect against oxygen reactive species and skin fibroblast stimulation of Couroupita guianensis leaf extracts. / Martínez A, Conde E, Moure A, Domínguez H, Estévez RJ. / Nat Prod Res. 2012; 26(4): pp 314-22. / doi: 10.1080/14786411003752094. Epub 2011 Jun 24. DEVELOPMENT & EVALUATION OF HERBAL SYRUP FROM COUROUPITA GUIANENSIS USED AS EXPECTORANT / G.Sandhyarani* and K.Praveen kumar / Asian Journal of Pharmaceutical Science & Technology, Vol 4, Issue 2, 2014, pp 101-103. Antioxidant & anticancer activities of isatin (1H-indole-2,3-dione), isolated from the flowers of Couroupita guianensis Aubl / Mariappan Premanathan, Srinivasan Radhakrishnan, Kumarasamy Kulangiappar, Ganesan Singaravelu, Velayutham Thirumalaiarasu, Thangavel Sivakumar, and Kandasamy Kathiresan / Indian J Med Res. 2012 November; 136(5): 822–826.